Earlier this month, the Board of Deputies declined to adopt a resolution urging “all those who oppose antisemitism to refrain from buying the Guardian or advertising in it”. The proposal, tabled by Zionist Federation vice-president Jonathan Hoffman, had already been rejected by the Board’s defence division but the division’s own alternative motion (a wrecking tactic if you ask me), noting the paper’s “continued biased and anti-Israel reporting”, and deploring the lack of action by the Press Complaints Commission, was also rejected. So, apart from rejecting both propositions, the Board did precisely nothing. But my concern today is not with the Guardian (for which I have written in the past), or with the concept of a free press – an argument that was, I gather, deployed by opponents of Hoffman’s initiative. My concern is with the Board. We can argue whether the Guardian really is an antisemitic newspaper and whether – if so – an Anglo-Jewish boycott of it would do any good. In the 1930s, there was a highly effective Jewish-led boycott of the pro-fascist Rothermere press. Lord Rothermere was a supporter of Oswald Mosley. Jewish companies were persuaded to withhold their advertising patronage from his newspapers. Rothermere soon came to heel, signalling that he had done so by ordering the papers to run articles praising the Jewish contribution to British life. So the “boycott” was highly effective. But this took place three-quarters and more of a century ago, before the internet age. I rarely buy the Guardian, preferring for a variety of reasons (not primarily economic) to read it online. Much of its advertising is placed by international conglomerates which, however “Jewish” some of them might appear, would be unlikely, in today’s economic climate, to forego exposure to make a political point. The Guardian has million of readers. CIF Watch has… errrr…. how many readers? 100? I hearby give a solemn pledge to boycott The Guardian – and the Observer from now on. Hang on – I didn’t buy it anyway ! No surprise that the Hofjuden [aka Board of Deputies] failed to pull their collective finger out. Why would any decent, reasonably sane person not wish to boycott the racist bordering on Nazi-compatible, contemptible Guardian? Incidentally, the Guardian should be boycotted not only on account of its dishonest anti-Israel coverage, but also because of its dhimmified relation with Islam per se. Derek that will be possibly only if people don’t act, whenever they can and within the law, to stop it! Islamic functionaries are only too willing to use democratic law to subvert democracy, and therefore we should be willing to use the same means to undermine them! As it is, all we are doing is talking about what should be done when we should be doing it! Rothermere soon came to heel, signalling that he had done so by ordering the papers to run articles praising the Jewish contribution to British life. Isn’t “came to heel” an unwise expression in this context? Your principal reason for opposing said move is that Tehran is blaming it on the Jews?? Perhaps I misunderstood you. 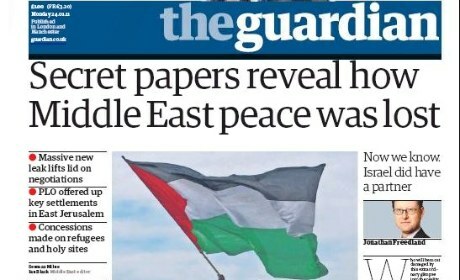 Guardian, the virulantly anti-Israeli rag bordering on anti-Semitism and encouraging islamism is all but finished anyway. No need for formal boycotts, people are turning away droves of their own volition. Jonathan, you spend so much time blogging here during office hours. How do you justify your London council tax payer-funded salary as Chief Economist at the Greater London Authority? And what about you, second-rate Beevis and Butthead, don´t you have anything else to do except for whining about Hoffman and Anthony? What a couple of weirdos. Go get a life. The rag is becoming ever more egregious. Good bye to sanctimonious hate speech! IA question needs to be answered: Jonathan, dearest, do your bosses know you spend an inordinate amount of office time – where you get a salary from council tax-payers’ money – at the Greater London Authority? I think they should be told. So, sweetasshole still has a crush on Hoffman. But is still undecided regarding Anthony. Poor Cleopatra. Poor Cleopatra…Hey, aren´t you spending an awful lot of time whining about Anthony? Who´s financing your hatred, sweetasshole? Hatred? You call financing by the Israeli government hatred? That´s right. Yours is a mix of hatred and love of Hoffman and Anthony. Still, you haven´t revealed who´s financing *your* relentless whining. Generally speaking, the galut mentality of predominant sections of the present Jewish leadership in both Britain and the USA is particularly worrisome – especially so at a time when the state of Israel as the Jewish homeland, faces multi-faceted, existential threats as never before in it’s history. Most importantly, American and British Jewry need to raise their voices now, fearlessly and unapologetically, urging their media and their respective governments to give Israel maximum moral and material support in countering the looming Iranian nuclear threat. I am all for an official boycott. It’s really regrettable that opportunity was missed. Boycotts are an expression of free speech. You oppose my existence. You lie about me. Fine. But I’m not buying your product. You post an open letter in your newspaper calling for an academic boycott of my universities. Again, that’s your choice. But why should I not boycott your newspaper? Why should I not try to hurt you financially when you support hurting me financially? And boycott companies that advertise in Der Guardians pages. Including the Israel Government Tourist Office? Good nakba, sickhearts, YES. ALL ADVERTISERS. Once again your fixation on Anthony. poor Cleo. You are suffering a lot, it seems. But you need to grow up and learn to deal with rejection as an adult, sweetasshole. Go for a walk, go to the movies or jump out of the window for once. Poor SmurfJew has been found out. I bet he’s using other pseudonyms here. Huh? Sweetasshole is also a delusional paranoiac. What a moron. The Israeli government is financing me. Gee! Me too! We are in the same payroll! Listen, we´re planning to go on strike for a raise. Be on alert. Secret meetings will be publicly announced soon. Your codename is sweetasshole (hope is ok for you). IF the Israel Government Tourist Office is advertising in Der Guardian, they should be ashamed of themselves. Who is financing your lazy whinings, sweetasshole? Do you have a job? SmurfJew, who’d employ you? You’d spend so much time responding to blogs as Thank God I’m an Infidel or Rupa or some other pseudonym/sock puppet, that you’d be out of work within the hour. I don’t know how Jonathan Hoffman has stayed under the GLA’s radar for so long.